It might not be Christmas, but it’s definitely come early this year thanks to Season Bingo! Powered by Dragonfish software and fully licensed by Cassava, this site is one of the safest and most trusted brands around. So what are you waiting for? Join today and see exactly what is waiting for you in Santa’s sack! 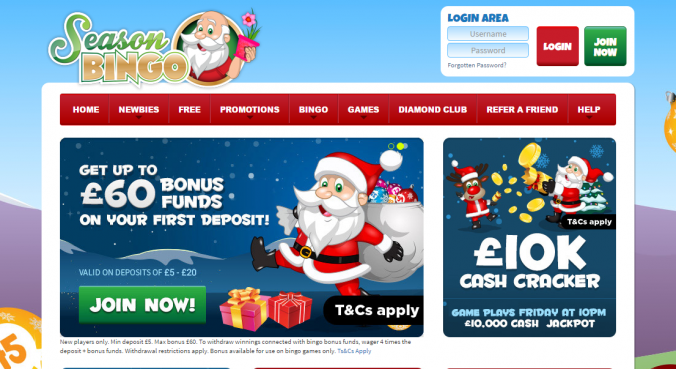 Since Christmas is the season for giving, Season Bingo dishes out £5 completely free with no deposit needed. On top of that, you will also acquire a 300% first deposit bonus, so if you fund your account with just £10, you will receive £40 to play. Better yet, there are also reload bonuses on every deposit and exclusive promo codes. Get a 150% second deposit bonus when you enter code TWO before depositing. Receive 100% extra when you enter bonus code THREE on your third deposit. The special offers and added value does not stop there though since Season Bingo has a wide range of promotions to keep you coming back for more. It’s possible to win extra shopping vouchers, huge guaranteed jackpot prizes in the £10k cash cracker games, plus bingo games start from just 1p a ticket. Inside the bingo hall, you will be able to play both 75 and 90 ball games. Newcomers get access to exclusive free bingo rooms when they make their first deposit, plus if you reload your account you will also receive additional free games access. Slots also start from as little as 1p each, with games such as Fluffy Favourites, Rainbow Riches and Irish Luck leading the way, there will never be a dull moment! If casino games are your thing, spend your cash on the table games such as blackjack or roulette, or why not have a few cheeky punts on the scratch cards! Phone number: 0800 024 6948. Licensing: UK Gambling Commission License. Season Bingo is one of the best Cassava Bingo sites around, with no deposit required in order to try out the games, we highly recommend that you claim the welcome bonus today. The 300% first deposit bonus also constitutes great value and has some pretty reasonable wagering requirements associated with it too. All things considered, this bingo site is worth a look. There are great games, great jackpots and a great chance of walking away with some winnings. So why not give it a go, sign up, log in to your account and grab your £5 FREEBIE cash today!